Thread: Global Warming is a hoax? #1 Global Warming is a hoax? So far as I can tell, the creator of this video has not submitted anything for review. I was wondering if anyone had any thoughts on his conclusions/assertions. He has a short news video blog detailing his observations every day. I'd say he has his own theories and he finds, or chooses, items from his preferred sources to bolster his view. And the more he does this, the more he reinforces his own view of his own accuracy. He's basically picking and choosing from the thousands of scientific observations and reports and creating his own, not very scientific, isolated little bubble. At its heart, the science of climate change is extremely simple physics. Increase the quantity of 'greenhouse' gases in the atmosphere and the system has no option but to get warmer. But that's a bit like saying that if you can generate enough power, you'll be able to take off and fly. Yes, planes do generate enough power to fly but you need a lot more than that to predict how the mechanism in question will respond in various circumstances. And in climate, there are about 10000 more levels of activity and of complexity than there are in building or flying a plane. If you want the good basic stuff on climate, start at Skeptical Science's The Big Picture . Read that post carefully, then hit the Most Used Climate Myths button and have a look at the (very long) list of topics on the site. Or go to Home and have a look at the most recent posts. I believe in global warming but I do not believe it is caused by man. What category does that put me in? I do not believe that radiative forcing can increase the temperature of our oceans without having a lethal effect on all surface life. People on this forum have tried explaining to me the way that radiative forcing can heat the oceans without destroying all surface life but their explanations were not convincing. The source of global warming remains a mystery to me but I suspect it has to do with the Earth's core. Many on this forum have given me their explanation as to why it is not the core, many with papers and citations to back them up, but for me the core is the logical source of the heating of our oceans. Now what would be changing at the core to cause an increase, I don't know. Just my two cents. Out of the Box, you can choose not to believe that human activities are changing the heat balance of the planet but it is a choice that is a consequence of your choices of which sources of information you count as trustworthy. You should be aware that every scientific institution that studies climate along with all the world's leading science academy - the US National Academy of Sciences and the UK's Royal Society being leading ones - conclude otherwise. They reached that conclusion by drawing on respected scientific experts, some directly involved in climate study and independent ones who are not but who possess sufficient skills to evaluate the body of knowledge and techniques used on their merits. I think there are very good reasons, including decades and centuries of high standards, both of intellectual abilities and ethical standards within those institutions, that make them deserving of trust. Given that there are expected to be profound and dangerous impacts (to existing ecosytems, to agriculture and to cities, towns and infrastructure) from unmitigated emissions of GHG's, your disbelief will, at best contribute to community reluctance to support, and at worst will contribute to active opposition to prevent timely and effective action to limit those impacts. I do not believe that radiative forcing can increase the temperature of our oceans without having a lethal effect on all surface life. I don't understand this. How much "increase" are you talking about to have a lethal effect? Just as there are massive daily and seasonal changes in local atmospheric temperatures which, usually, result in pretty stable long term, global scale temperatures, there are massive absorptions and release of energy in the Pacific over years or decades through the ENSO processes as well as huge changes in the amount of energy absorbed and released in shallow waters and in overturning regions. These changes promote or suppress certain organisms locally and seasonally, but these systems are pretty resilient. Do you understand the properties of CO2 and H2O gases that makes them absorb radiation at certain frequencies? I've got somebody arriving in a couple of minutes, so I'll have to put off tracking down the videos, but there are some good ones showing both the molecular configuration and the activity of the gas. Later. It's not so much just a question of whether or not global warming is real or even a question of whether or not man is primarily responsible. The issue, in my opinion, is that the proposed solutions for athroprogenic global warming are ridiculously expensive and impose a cost that is way out of proportion to the benefit. I would support a small carbon tax if the funds that it generated were to go towards research into alternative energy (especially fusion), but I certainly do not support policies such as cap and trade or excessive regulation of carbon output that do much to harm our economy and very little to benefit the environment. Do you understand what radiative forcing means? It simply means strongler sunlight reaching the oceans. Period. Why would that kill surface life? It's not only cap and trade. Conservation and improved efficiencies would get us at least a quarter of the way there using well proven techniques. To take a simple example, my wife and I have been looking for a home in an area we like. The average home there was built between 1925 and 1950. Two of five we've looked at had absolutely no insulation at all, none of them were anywhere near to what most would consider good insulation. Part of the problem is of course, the start and stop incentives, typically only given during bad years when people living in these homes are already short on a job and cash. Furthering the problem is stringers, often bills too heavily influenced by the construction companies, which mandate contractors do with work, even for things any handyman could do. Kalster, actually the change is not in the amount of solar energy reaching the surface (except via secondary impacts like changes to clouds) but by changes to the amount of Infrared radiation leaving the top of the atmosphere. GHG concentrations need to be low enough that atmosphere becomes transparent enough at the top of atmosphere to allow Infrared energy to escape to space. Higher CO2 concentration increases the altitude at which the atmosphere becomes transparent enough. At that higher altitude, it is cooler and that slows the rate at which it radiates heat away. The flow of heat from below is slowed, right the way down to lower atmosphere, which slows the flow from land, ice and ocean into the atmosphere. The increase in heat at the surface is primarily from the heat retained and re-radiated from the atmosphere above, not more solar energy reaching the surface. OK. I found these 2 items. The first one shows how CO2 vibrates when it absorbs photons. The second one is a visual demo of the effect of CO2 absorbing infrared - you see it happen. I haven't included any graphs showing how the earth's outgoing radiation profile changes at the various frequencies. If you want those I'll track them down. Sorry, thought he was asking specifically about the sun increasing its radiance as a purported explanation for the current warming trend. Thanks for the explanation. Kalster, I missed that bit of context for your comment. madanthonywayne, when you disagree with the conclusions of all the scientific institutions that study climate there's no question which conclusion I trust most. Dangerous to catastrophic changes to the climate system we depend on seems to be the consensus mainstream science based expectation. With the effects being effectively irreversible - and including an ongoing lag between rise in atmospheric levels of GHG's and the full impacts that helps lull people into a false sense that nothing much can happen because it hasn't been too catastrophic so far. That efforts to date have been ineffective really means we need efforts that are effective - not cease to make any effort. It is worth it. For people who live in prosperity, relative luxury and who routinely waste more energy and resources than our ancestors ever imagined, paying to have low emissions energy is not a huge thing to ask. The greatest impediments to effective solutions are, in my opinion, disbelief that the problem is truly serious, or because of human activities, or is amenable to solutions or is worth the expense. The issue, in my opinion, is that the proposed solutions for athroprogenic global warming are ridiculously expensive and impose a cost that is way out of proportion to the benefit. The issue about catastrophic economic effects of avoiding further climate disruptions always amazes me. A lot of the proposed costs are in the replacement of things that will cost money to replace anyway. There are additional costs, but there are also additional costs involved in persisting with current policies. 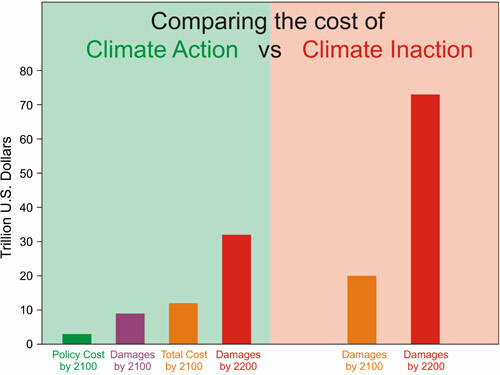 This graphic below is from The economic impacts of carbon pricing Note the "Policy Cost" bar compared to the "Damages Cost" bar. For those who like to catastrophise over economic impacts of climate change and its consequences/mitigation, here's a suitably glum view on food prices - and on gardening in an uncongenial climate.